Certified 100% Organic Cotton Hypoallergenic Long Sleeve Crew Neck NATURAL Tee Grown and Made in USA. These Hypoallergenic Organic Cotton Tees are natural in color, and you can see the flecks of cotton throughout the Tee. Natural means NO DYES and NOT BLEACHED - which allows our chemical sensitive customers to have a shirt they can relax in and wear comfortably. The Ribbed CUFFS around your wrists are also made from 100% organic cotton - NO spandex or elastic or lycra... just 100% organic cotton. This WILL shrink about 5% (which is about 1 inch in width, and 1 1/2 inches in length). This is a tee that gets softer with age and washing. Note, these Tees are sized to fit snuggly, and the manufacturer tells us they are sized up to allow for shrinkage on your first wash (but we recommend you order a size larger) This Tee is SLIM so it's great if you like a snug fit - so before you wash it, it will be larger and will shrink after the first wash. Also, they will feel stiff when you first get it, but as soon as it's washed, the softness begins! Soft and relaxed, yet durable and versatile. Great staple for your wardrobe. This is NOT pre-shrunk, and we recommend washing in cold water and line drying - and wash with similar color items for the first couple times. We recommend ordering UP a size as these tees are sized to fit SNUG. Gender Neutral sizes. Sizes S, M, L, XL, XXL . Check our Sizing Chart for measurements of the garment before shrinkage. 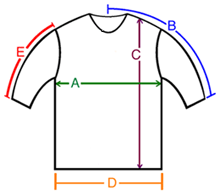 A: Chest / Bust circumference 33" 36-37" 41-43" 44-45" 46-47"
B: Sleeve length from center of neck to end of sleeve 31" 32.5" 34.5" 37" 38"
C: Body length from shoulder to bottom of hem 28" 29" 30" 30" 31"
D: Hem circumference 36" 37" 43" 46" 48"
E: Sleeve length from shoulder to end of sleeve 22" 24" 24" 25" 26"